In 2015, B.R. Howard purchased a 32,000 square foot art conservation studio and lab known as the Commonwealth Conservation Center. This was done to expand their capabilities and facilitate art conservation treatments and art storage of macro sized sculpture and objects. This newly renovated art conservation studio provided more opportunities for working on the restoration of larger objects due to its capacity and 10’-18’ high ceilings. The studio’s 3 external loading docks make it simple to transport large sculptures and artifacts to and from the lab. Once objects are in the building, the large open floor plan, in-house workshop, and photography studio all act together to create a seamless workflow for projects from beginning to end. Our facility is climate controlled, equipped with a sprinkler system, and a security system with cameras. B. R. Howard also maintains and utilizes their 53 acre farm and 7,500 square foot workshop for paint stripping, media blasting, and material and equipment storage. Our conservation lab is conveniently located in Carlisle, PA, famous for their summer car shows. 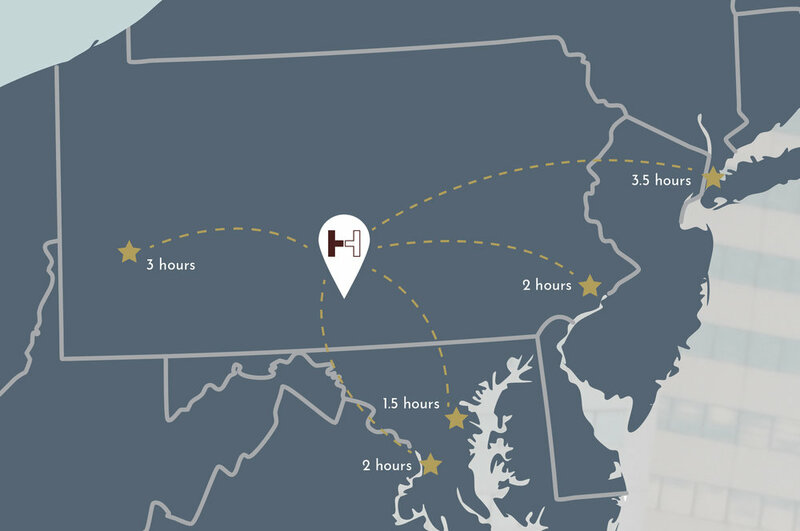 Due to our centralized location and highway infrastructure routes the area has become the leading trucking, distribution, and logistics hub of the east coast. We are only a few hours from many large cities and metropolitan areas.